Vertical series boat lifts are constructed of special T-6 6061 aluminum extrusions and load tested from 130% to 200% its rated capacity. Much of the hoists construction utilizes bolts rather than welds to allow for easy transportation and on site assembly. This offers a big advantage over other manufacturers who require their 11′ wide lifts to be carried from the driveway down to the water fully built or floated in from a local boat launch. The hoists high vertical lift design keeps your boat far out of waves reach. Informed consumers prefer the vertical type design due to the increased lift capacity and safer frame design. Our Popular PWC Lifts are made from the same materials as our larger lifts and come in both a vertical design as well as two more economical cantilever designs. 1. All hoists have fully adjustable legs with pivoting base pads for level installation. 2. Stainless cables and corrosion resistant fasteners. 3. Durable nylon pulleys with bronze bushings. 4. Unlike other hoists our patented chain and gear driven winch system is made for boat hoists, it is not a simple boat trailer winch. They are sized and geared accordingly to the lifts weight capacity and still easy to turn on all hoist sizes. 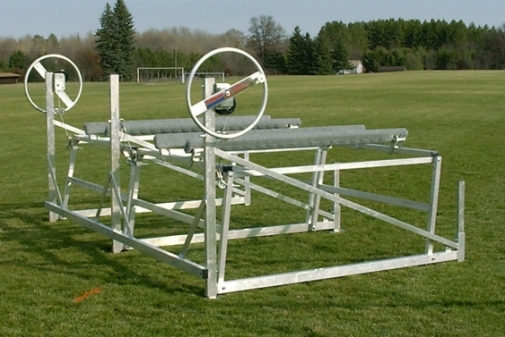 The winch wheel is larger than most, a full 48″ in diameter allowing for easy use. Unlike other lower cost winch systems, ours incorporates a winch cable guide to evenly distribute cable across the drum which prevents cable climbing and bunching. 5. All hoists have standard adjustable bunks that will accept in-board ski boats. 6. Optional full length guide on bunks, and motor stop. Optional solar powered 12v winch unit is available and comes with a solar panel and mounting bracket. Optional roof systems are available in the color multiple colors.